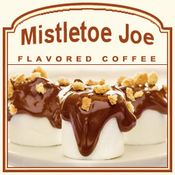 Mistletoe Joe is a decadent flavored coffee with sweet chocolate flavors folded into a French vanilla swirl and a hint of cinnamon-sweet graham crackers. With an aroma that will stir your senses and make your mouth water, the Mistletoe Joe coffee is perfect to warm your spirit with that familiar holiday cheer. Made with 100% authentic Arabica coffee beans, this chocolaty coffee offers an indulgent, full flavor that only has 2 calories in each cup. Mmm � go ahead, indulge in our glorious Mistletoe Joe coffee. Roasted and shipped on the same day, the Mistletoe Joe flavored coffee will hit the spot with its succulently sweet flavoring. Packaged in a heat-sealed valve bag, you can expect the freshest and highest quality of gourmet coffee possible. Whether you want to give in to this tempting flavored coffee during the holidays or year round, FlavoredCoffee.com has your Mistletoe Joe covered!